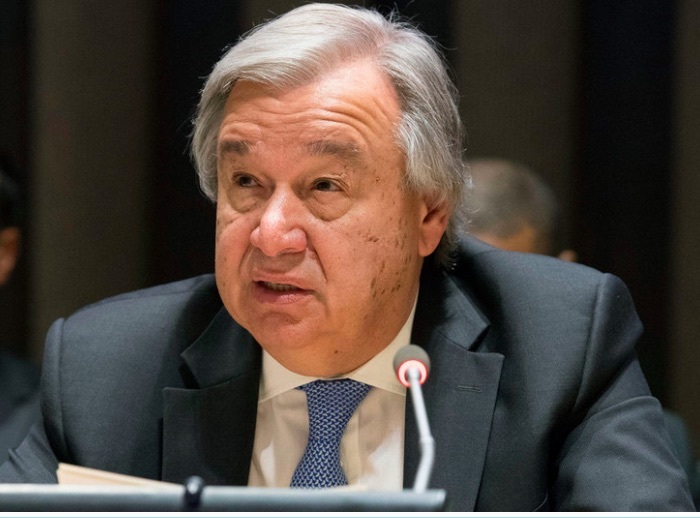 “The United Nations was created with the goal of eliminating war as an instrument of foreign policy,” Secretary-General António Guterres said, unveiling his new agenda, entitled, Securing Our Common Future, at the University of Geneva, in Switzerland. “But seven decades on, our world is as dangerous as it has ever been,” he warned. “Disarmament prevents and ends violence. Disarmament supports sustainable development. And disarmament is true to our values and principles,” he explained. The launch comes at a time when “arms control has been in the news every day, sometimes in relation to Iran and Syria, sometimes the Korean Peninsula,” said the UN chief. The new Agenda focuses on three priorities – weapons of mass destruction, conventional weapons, and new battlefield technologies. Can we abolish all nuclear weapons? First, he stressed that disarmament of nuclear, chemical and biological weapons could “save humanity,” noting that some 15,000 nuclear weapons remain stockpiled around the world and hundreds are ready to be launched within minutes. “We are one mechanical, electronic or human error away from a catastrophe that could eradicate entire cities from the map,” he warned. Mr. Guterres said the States that possess nuclear weapons have the primary responsibility for avoiding catastrophe. In that regard, he appealed to Russia and the US to resolve their dispute over the Intermediate-Range Nuclear Forces Treaty; to extend the New START treaty on strategic offensive arms, which is due to expire in just three years; and to take new steps towards reducing nuclear stockpiles. Second, he said disarmament of conventional weapons could “save lives,” in particular those of civilians who continue to bear the brunt of armed conflict. The UN chief said that beyond the appalling numbers of civilians killed and injured, conflicts are driving record numbers of people from their homes, often depriving them of food, healthcare, education and any means of making a living. At the end of 2016, more than 65 million people were uprooted by war, violence and persecution, he said. “My initiative will have a strong basis in the 2030 Agenda for Sustainable Development, the world’s blueprint for peace and prosperity on a healthy planet,” he said, noting that excessive spending on weapons drains resources for sustainable development. In fact, more than $1.7 trillion dollars was spent last year on arms and armies – the highest level since the fall of the Berlin Wall. That is around 80 times the amount needed to meet the humanitarian aid needs of the whole world, he said. Third, he said that new technologies, when used maliciously, could help start a new arms race, endangering future generations. “The combined risks of new weapon technologies could have a game-changing impact on our future security,” he said.